On Monday we remembered Palm Sunday when Jesus rode into Jerusalem. The crowds praised him, shouting Hosanna. On Tuesday, we re-lived The Last Supper, the last meal Jesus shared with his friends. He humbled himself to wash their feet, then broke bread and poured wine for them. Every time we receive Holy Communion we remember what he told them- do this in memory of me. On Wednesday we saw the agony of Jesus in the Garden of Gethsemane. We watched as Judas betrayed his friend and gave him away to be arrested by the soldiers. Finally, on Thursday we remembered Jesus’ death on the cross. We adore you Oh Christ and we praise you, because by your holy cross, you have redeemed the world. When we came back to school after the Easter holiday we heard the stories of Jesus’ resurrection from the dead. He rose again so that we too may one day rise from the dead. This entry was posted in Catholic Life, Events, Events 2014-2015 on March 31, 2015 by jtibbits2013. The children from Abraham House are this term’s House Point winners. Here they are enjoying their prize treat – spot the experts! This entry was posted in Events, Events 2014-2015 on March 31, 2015 by jtibbits2013. Year 3 had an inspiring day with Jacob Gruber from Free the Children all about being an active citizen. They learned about the power that one person has to change the world. This entry was posted in British Values, Events, Events 2014-2015 on March 31, 2015 by jtibbits2013. On the 20th March 2015 St Vincent’s had a Refugee Day. 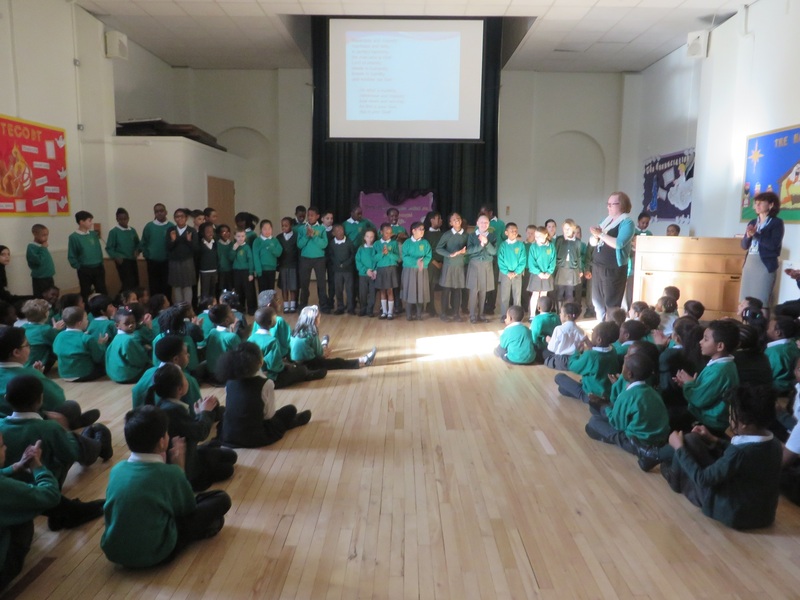 We started the day with a whole school assembly; we invited a lady called Paulette along to speak to us. She came as a refugee from West Africa and was an asylum seeker in the UK for 7 years and 4 months. She had to leave her family and her son behind when she left her country. During the day we had workshops in class looking at facts about refugees, we thought about what we would take if we had to leave home quickly and we took part in a meditation. At the end of our session we had to think about what we liked during the day, or any feelings we had and write them on a large piece of sugar paper. This entry was posted in Catholic Life, Events, Events 2014-2015, International Days, Respect on March 25, 2015 by jtibbits2013. This entry was posted in Events, Events 2014-2015, International Days on March 16, 2015 by jtibbits2013. Lord guide us on our journey of prayer, fasting and almsgiving. This year we have been raising money for Mary’s Meals. So far we have raised enough to feed 43 children for a whole year! That’s a lot of children. This entry was posted in Catholic Life, Events, Events 2014-2015 on March 16, 2015 by jtibbits2013. Thank you to author, Steve Smallman, who spent the day with us and showed us how he writes his stories and draws his illustrations. We had a sneak preview of his new book, Hippo-Bottymous – it’s brilliant! We have a huge collection of Easter Eggs ready to take to the children’s hospital to cheer up those who are poorly. Thanks to all the children who brought them in. Have a look at the photos of your costumes. More coming soon. This entry was posted in Catholic Life, Events, Events 2014-2015 on March 5, 2015 by jtibbits2013.